Burgers, step aside. Corn on the cob, stay in your lane. Apple pie? Nice try. 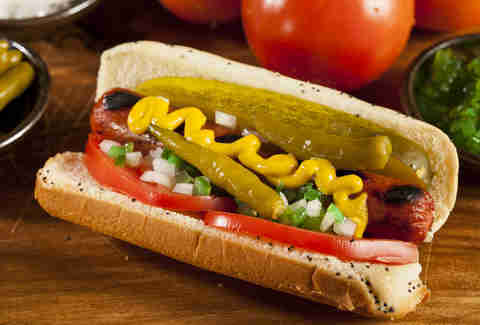 No, there is no food more American, more essential to our national identity, than the almighty hot dog. Call them wieners, bangers, franks, or dogs: this is the cuisine that makes us proud to call ourselves bloated, oily skinned, and ever-thirsty Americans. They're handheld snacks that animate childhood camping trips and Sunday afternoon ball games alike. 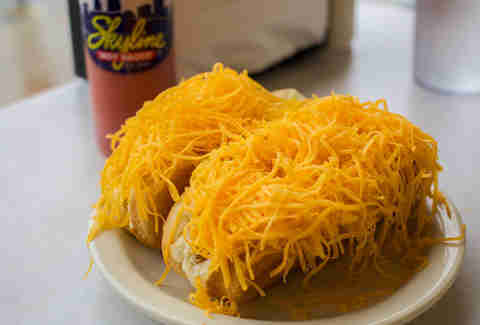 A shared love for this national dish unites folks from sea to shining sea, and yet each US region reps its own unique take on this special meal on-the-go, reflecting the same fiercely independent spirit exhibited by our sausage-loving forefathers. 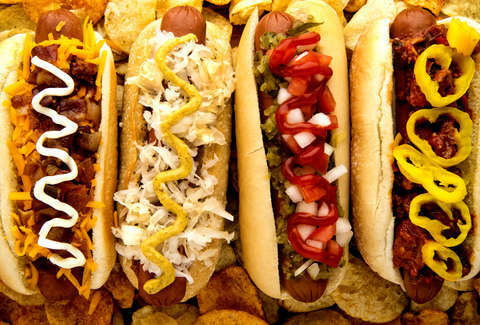 By our count, there are 41 different regional hot dog varieties. Here they are, in all their natural-cased glory. The dog: An all-beef Sabrett frank in a natural casing, griddled and served on a toasted bun with deli-style mustard, tart sauerkraut, and each vendor's signature version of the ubiquitous red onion sauce (a mix of onions, tomato paste, and vinegar). The dog: A skinless, all-beef, kosher dog (usually Hebrew National or Sabrett), boiled in a deep tank of questionably sanitary water, topped with a stripe of spicy, pale yellow, deli-style mustard, a spoonful of red onion mystery sauce (optional), and handed over in a soft white bun. The dog: A hangover-curing, calzone-like mess comprised of a skinny, all-beef, deep-fried dog, crammed into a half-round of pizza bread and topped with fried or sauteed onions, greasy red peppers, and fried potatoes. 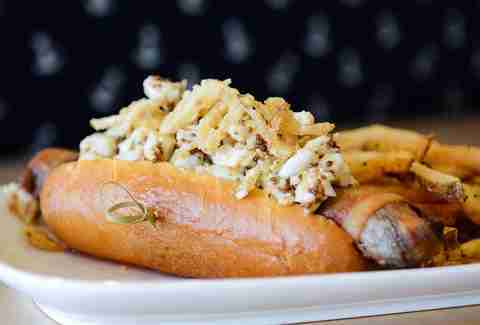 The dog: A coarse pork and/or beef banger smoked and served in a traditional soft white bun with tons and tons of chili on top. Ben's Chili Bowl is the most famous. But whether it's the best is worth exploring to find out for yourself. The dog: An all-beef dog sliced down the middle and stuffed with Cheez Whiz and crispy bacon, then grilled and served on a toasted bun. Philly does not mess around when it comes to bunned meat. 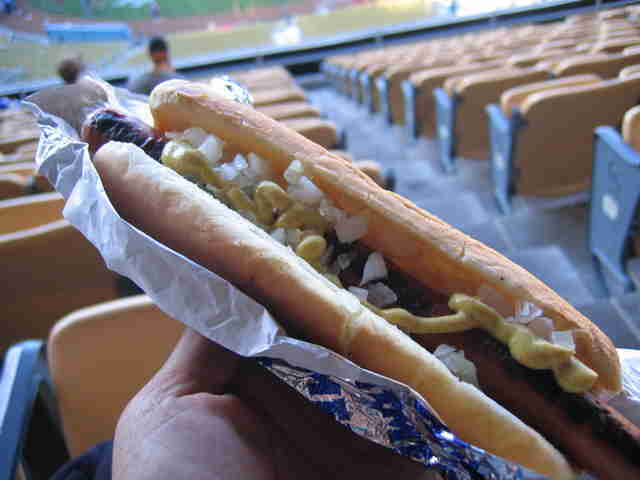 The dog: A griddled, all-beef dog in natural casing, garnished with meat sauce, mustard, chopped raw onion, and celery salt and sheathed in a steamed, side-cut roll. 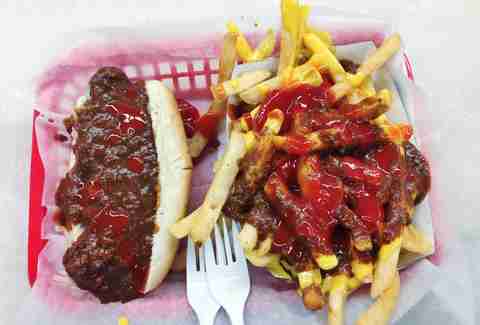 Olneyville New York System in Providence is the gold standard. 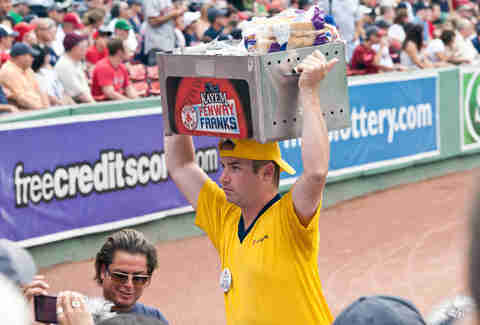 The dog: A fat, boiled & grilled all-beef or beef-and-pork frank, shoved into a New England-style bun and dressed with mustard, relish, and, in some cases, a scoop of Boston baked beans (Green Monster sold separately). 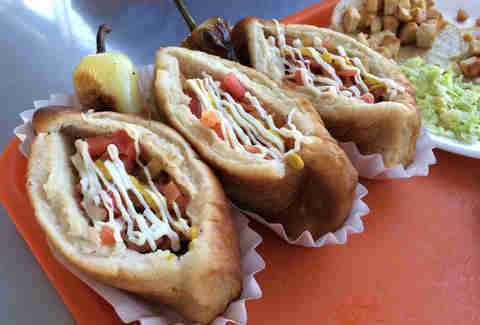 The dog: A deep-fried pork-and-beef dog in natural casing that tears and crinkles (i.e., "rips") when it's cooked, dressed with mustard and/or spicy-sweet relish and served in either a regular or toasted hot dog bun. Rutt's Hut claims to have been the first to rip these suckers out back in 1928. They haven't changed in the intervening decades. Place of origin: Philly. Again. Hell yeah, Philly! The dog: An all-beef frank steamed in a natural casing, doused in minced meat chili (no tomatoes, no beans, no problem), garnished with chopped raw onion and mustard, and loaded into a steamed split-top bun. 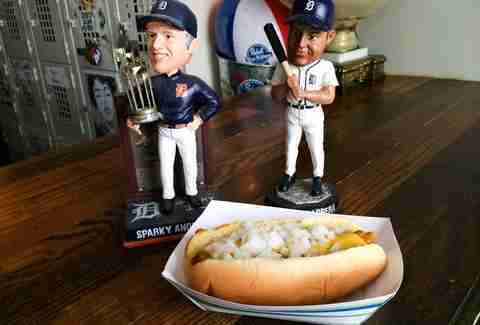 Reminiscent of the coney dog, which, confusingly, isn't actually from Coney Island (more on that later). The dog: A 50-plus-year-old recipe that includes chopped hot dog pieces floating in a bowl of chili, raw onion, pickles, and a smattering of oyster crackers. That, friends, is surf and turf, Georgia-style. The dog: A classic Vienna Beef frank in natural casing, simmered in water until plump or charred to order, cradled in a steamed poppy seed bun, and "dragged through the garden" (i.e., artfully decorated with fresh tomato slices, chopped white onions, sweet neon-green relish, sport peppers, bright-yellow mustard, a dill pickle spear or two, and a few good shakes of celery salt). Basically, this is a form of currency on the left shore of Lake Michigan. 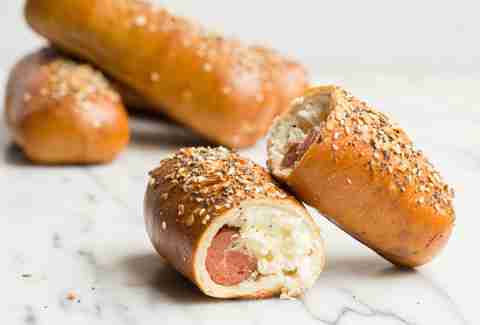 The dog: A regular or mini hot dog wrapped pigs-in-a-blanket-style in everything or poppy seed bagel dough, then baked in a high-heat oven and served with a side of yellow mustard. 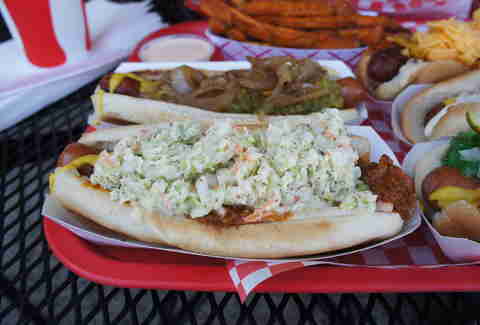 The dog: A juicy grilled kielbasa sausage on a hefty roll, dressed with coleslaw, BBQ sauce, and hot sauce, and finished with a steaming-hot pile of fries on top. Seti's is the best. Or is it? The dog: A lot like a Chicago dog for heart-attack enthusiasts, it starts with an all-beef, bacon-wrapped dog, split and stuffed with soft Velveeta cheese. Then it's deep-fried, crammed inside the requisite Chicago-style poppy seed bun, and then often (but not always) "dragged through the garden." You know. For your health. The dog: Small-ish all-beef or beef & pork combo wieners, plopped into a steamed bun and drenched in coney sauce (a salty, beanless chili made from beef heart and spices), mustard, chopped raw onion, and a big handful of shredded cheddar cheese. Common knowledge dictates you claim loyalty between Lafayette and American. The dog: Another small all-beef or beef/pork dog in a steamed bun, with a dry, fine-ground beef heart-based topping instead of Detroit’s soupier chili. The best is at Angelo's. If it's not made from a Koegel's Vienna, it's fake. The dog: A grilled, bacon-wrapped hot dog popped into a hearty, round, steamed bolillo roll, and covered in pinto beans, chopped tomatoes, diced raw onion, creamy avocado, a blast of mayo, a handful of fiery jalapeños, and shredded cheese (optional). Like a burrito. 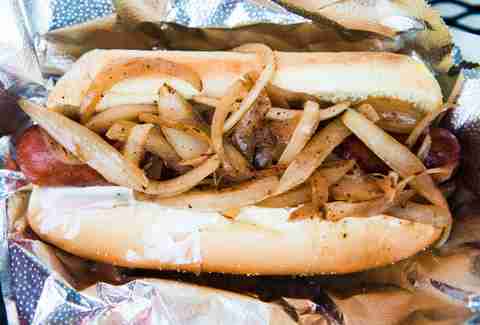 But with a hot dog instead of carnitas. And a bun instead of a tortilla. 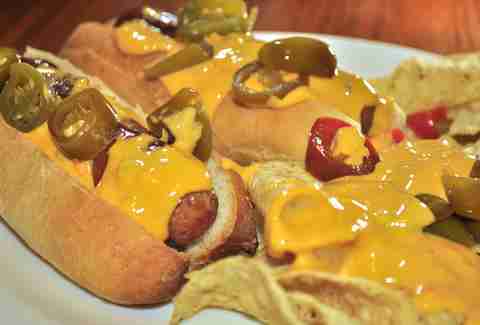 The dog: A char-grilled Vienna Beef hot dog served in a simple bun with nary a condiment. Basically, the least Nevada-like of all the dogs on this list. The dog: A grilled all-beef dog, flush with chopped red onion, green chili sauce, sour cream, and sliced jalapeños and nestled in a steamed or toasted bun. Best paired with Maureen Dowd jokes. The dog: A hot dog made of unidentified meat, wrapped in bacon and deep-fried, then tossed into a soft bun and topped with any number of condiments, including (but not limited to) fried onions, mayo, mustard, ketchup, and grilled jalapeños. Essential: must be served by an unlicensed vendor, preferably on a sketchy California side street. 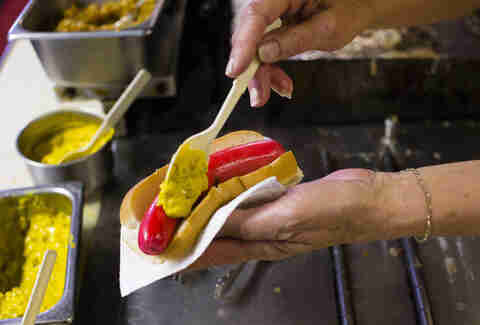 The dog: A skinless, foot-long pork hot dog, steamed or grilled and cradled in a foot-long steamed bun, then topped with relish, mustard, ketchup, and chopped raw onion. Insert your own joke here. 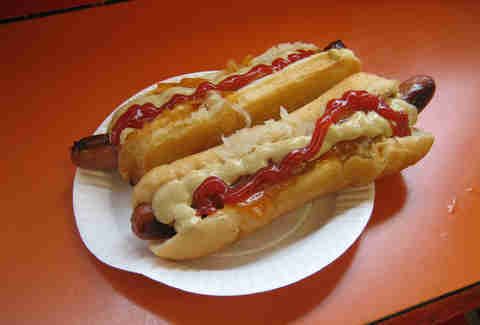 The dog: A foot-long frank, loaded with grilled peppers, sauerkraut, and onions and served in a matching foot-long bun. Coors optional. Meredith Heil is a staff writer for Thrillist. She got more franks than a hot dog man. Tell her she forgot your state’s dog at @mereditto.